​Protection you can count on. Free battery replacement and Roadside Assistance. 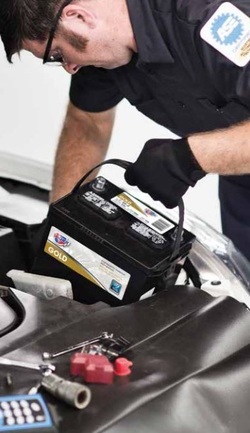 Every new, professionally installed CARQUEST® battery comes with free replacement* and 24-hour Roadside Assistance* . When you purchase a CARQUEST battery at a participating professional repair shop and have it installed there, you’re getting more than just a high-quality battery that delivers reliable starts and power every time. You also get the added protection and peace of mind that come from knowing you’re covered by a complimentary Roadside Assistance Program should anything happen. ​• Locator Assistance – If your battery fails and you can’t drive your vehicle to the original battery installer, call 1-844-255-8137 (toll-free) for assistance locating the nearest battery installer. When battery trouble strikes, one call to the Hotline is all it takes. Someone will be there to give you a jumpstart or provide you with towing services that will be reimbursed up to $75. If your battery fails within 25 miles of where you purchased it and had it installed, it will be replaced and installed there again for free. If you’re more than 25 miles away, you’ll be referred to one of over 75,000 participating locations nationwide for the complimentary replacement and installation. And if you’re more than 100 miles from home when battery trouble strikes and need to stay overnight because a new battery isn’t available right away, you’ll also be reimbursed up to $250 for eligible meal and lodging expenses, in addition to receiving the complimentary battery replacement and installation. Making a claim couldn’t be easier. Service secured through any other source or dispatcher is not eligible for reimbursement, so be sure to call the Hotline first.